Food will be provided by the award winning @eatwithspencer and all dietary needs will be catered for, just let us know at the time of booking. The Redway Runners Furzton Relay returned for the 5th year this weekend. The Redway Runners Furzton Relay is a timed 4-person relay race held on the redways and paths around the beautiful Furzton Lake in Milton Keynes. Each lap is approximately 2.5 miles and is suitable for all running abilities. This year the event celebrated MK’s 50th birthday and will limited entries to 50 teams. Each team name was named after landmark in Milton Keynes. Notable team names included: The Great Xscape, What’s the Point and Willen Us On. Trophies for 1st, 2nd and 3rd team went to Rutherford, There is a POINT to all this running and fitMK Becon flyers. All podium teams put in a cumulative time of under 60 minutes for the 4 x 2.5 mile route. The club raised £329.45 from a cake sale in aid of their Charity of the Year, the Milton Keynes Hospital Charity. The alarm clocks rang at houses across Milton Keynes at ridiculous o’clock this Saturday morning, so early in fact that it was still dark!! The skies outside were cloudy and grey as we clambered into our chariots to make our way to some little village in Oxfordshire called Lucknow where we were to start a running race across some trail path to somewhere in deepest darkest Wiltshire and a circle of ancient stones. Our Saturday group consisted on Pet Hedges, Kerry Cooper, Chris Mahoney , Sean O’Leary, Paul Jones, Steve Morris, Stephen Dunham, Mick Bates and Neville Rowles with Janet Maidment and Mary Morris coordinating the much needed ‘support and encouragement crew’. The Sunday team of Zaid Alani, Niam Hani and Louise Bailey were lucky as they were having an extra days rest We were also missing a few with Kevin Ferris, Amanda ‘one leg’ Holland and Ros Crawley having fallen by the wayside being sadly beset by injury. Rumour has it that ‘one leg was still considering running the event just a few weeks out despite being encased in plaster !! 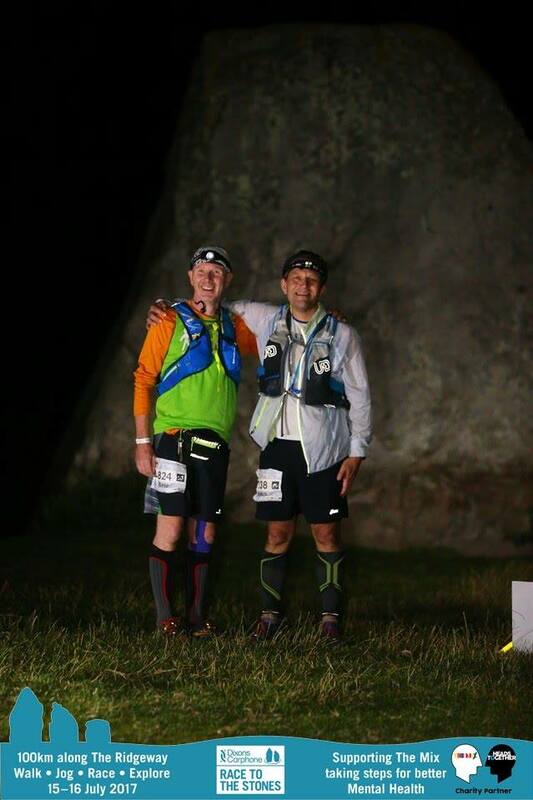 Now at this point it began to dawn on us what a silly stupid foolhardy idea this had been, usually most of us race 10Ks and Half marathons and so the longest we race most of the time would be for two hours or so. 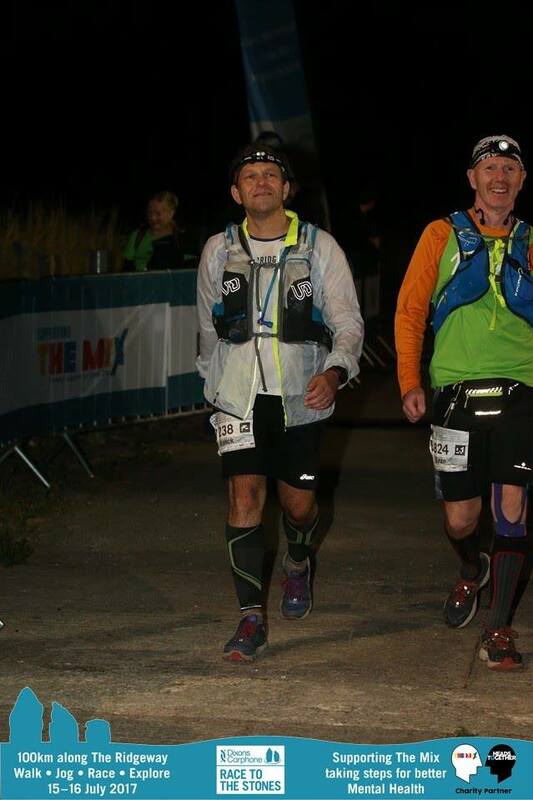 To make it worse, there were a couple of seasoned Ultra/trail veterans with us in Paul and Pet who a) Should have known better b) Should have talked sense to us !! So, anyway, down the leafy lane we went chatting away with either a mere 50k or 100k to go !!! After about 30 minutes Stephen dropped me, but having run with him before I was convinced his pacing strategy was all wrong and he would come back to me, oh how wrong I was !!! The aid stations/pit stops were superb and I think it is fair to say that most of us made a damned good effort to replace every calorie that we had lost in the previous stretch. The selection available was amazing and would have tickled the fancy of many a Redway Runner with energy bars, cake, nuts, cake, gels, cake, chocolate, cake, oranges, cake , I think you get the picture. After going along a bit and down to the Thames valley and trotting through the lovely village of Goring we all knew what was coming and it was up, up, up. Anyway, not soon after half way was reached where some of us stopped, some of us finished for the day and some of us were starting the next morning. Unfortunately, I was in the group of extremely foolhardy ones who in our naivety had decided that as we can run a marathon, to chuck a few extra KM to do 100km non-stop on would be a piece of cake. 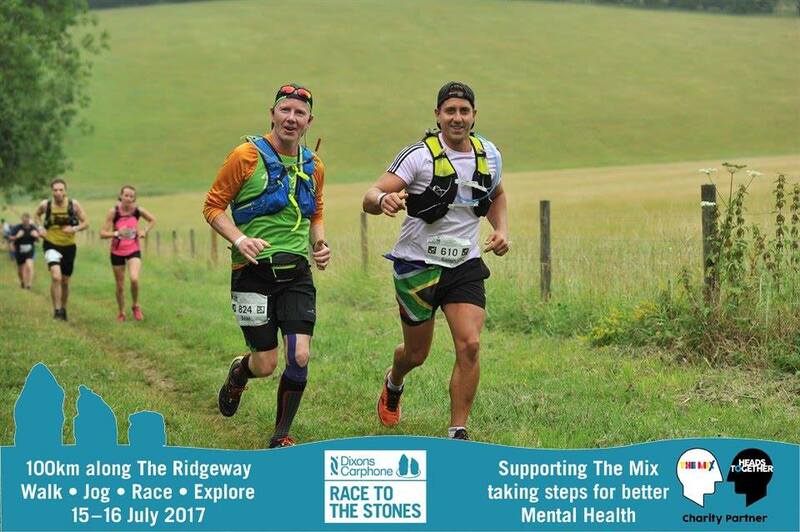 For us there was no respite, no tent, no bar, no massage to have but more of the awesome undulating scenery of the Ridgeway. Apparently, we trudged through the Vale of the white Horse, the North Wessex downs, Grims Ditch and much more, according to all of the information we were given, ‘when you cross the Thames and head into the downs the scenery changes as it opens out into the classic sweeping views’ I honestly can say that I can’t remember them and I was barely looking further than 20 feet in front! So why did we do it? Well, all of us ran for charity, Stephen ran for MK Bridgebuilder trust, I ran for Cancer Research Uk and everyone else ran for the club charity Milton Keynes Hospital Charity. No that the muscles are beginning to recover, the chaffing is disappearing and the calories are being replaced it was really good fun. 100km in one bash: Chris Mahoney, Stephen Dunham, Neville Rowles, Sean O’Leary, Paul Jones, Steve Morris. 50km Day two: Niam Hani, Zaid Alani, Janet Maidment, Louise Bailey. 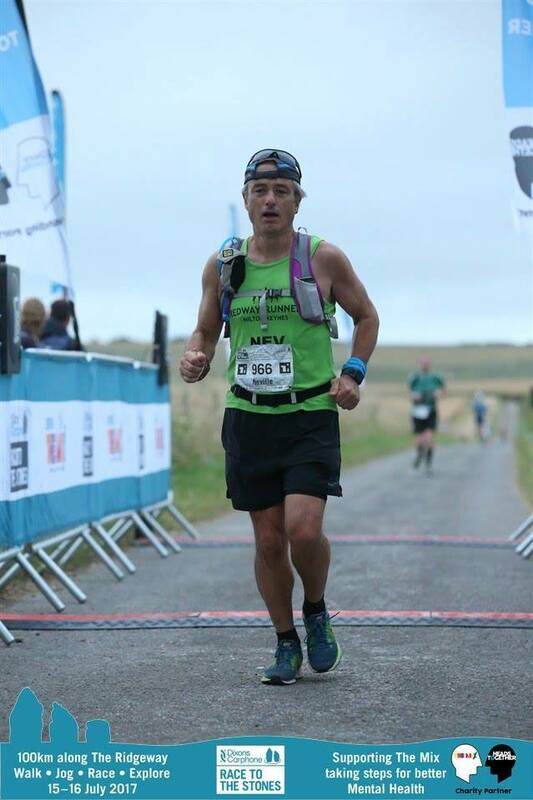 We managed to catch up with Sean O’Leary after he completed Race to the Stones in July 2017, this is what he had to say, so hey Sean how did the race to the stones go? What can I say… I finished, which was the main goal. The weather was ideal, some light rain in the morning, getting a little heavier in the early afternoon but the sun came out later to see us through the second half. The support from the Redway Runners team was fantastic, popping up every 10k or so. At a lay-bys, outside a cafe. Lots of hugs and smiley faces all round. It was great to see Mike and Carol Webber looking cool and relaxed just before the rain started. All was rosy up to half way…Leg was holding out quite well. I even managed to help a guy struggling to run into the half way mark. A minor blister on my little toe. So food and a plaster and I felt right as rain again. It was fantastic to see Zaid and Niam at the camp. After a few photos and hugs, I built up the courage to set off again. All good, let’s go……. Why was it so hard to get going again, I just can’t say. The “walk hills..run everything else strategy…” really kicked in at around 60k. Between 60 and 70k we were getting near Swindon and about to go over the M4. I put in some real effort to get going again as we were on a busy road but I was forced to stop by a fast car heading my way, so found myself in the verge. OK, off we go again but I think I’ve blisters on the ends of my toes now…How the hell.. Never mind, a very nice lady has just told us the next pit stop is just over the M4 bridge and off to the right, so I can sort myself out there.. I start what turns out to be the most horrible section of the race. I can feel every little stone and definitely feel all those big sharp pointy ones too. Turns out, that just past the bridge, must have been a good 7k..bad decision. Eventually, I get to the pit stop. First aid..socks and shoes off, flat coke (with a spoon full of table salt) in one hand and a cup of tea in the other, I get some nice lady to look at my toes. “This could hurt she” said, with a needle in hand..well she wasn’t wrong. She popped the ones which still hurt and left the ones that I couldn’t feel any more. Then she said, do you have any pain killers….Doh, of course I do, so why didn’t I take them.. Obviously, the brain had stopped long ago. There were a couple of guys sitting next to me, one with issues a bit more serious than mine. Off I go again, feeling a little better, with only 30k to go. Less than a marathon, how hard can it be. I even start running again on the flat. The light is starting to fade now but I am OK for a bit. Time for a sing song, so on the music goes. (whatever gets you through). That French guy passes me, I pass him, he passes me again I catch him and we start chatting.. He has had to leave his friend behind. Wow what a difference some company makes as we get to 80k quite well. Short break this time as it is getting dark. So, on with the head torches ready, can you believe that some people didn’t even bring one. A nice stretch through some fields, saw some cows, went around the cows. Lights go on and we make it to the last pit stop. Now, I haven’t said yet, but the people at those pit stops were fantastic. I think they must have had a competition going on. One guy said to me, “It’s you, we weren’t expecting you for at least another hour” .. You wouldn’t believe how much that cheered me up. The food was great, from the first pit stop to the finish. I didn’t want for anything (except perhaps a lift). Off we go again, for the last 10k or so. Pitch black, with head torches on. (Thanks to Sara-Jane King, as mine is perfect for the job) Last bit of the course goes up, down sharply, up again and a long downhill to the stones. We even try to run the flat and uphill bits as we know the last downhill is too treacherous to run. We pass a guy on the phone, crying and telling his girlfriend that he needed to talk to someone and that no one has talked to him for the whole second half. People are asking how far it is to the end because their batteries have gone on their watches.. I check mine.. Battery low!! Never mind, only a parkrun to go.. I try to imagine myself going around Willen Lake. Not far then. We hit a tarmac path and start seeing lights coming the other way, it’s all a bit confusing but Franck explains that we go to the stones for a photo before coming back to the finish. He starts joking with people coming back, asking them if they had seen God when they touched the stones but no response from anyone. We get to the stones, luckily we have head torches on as it was pitch black. A dismembered voice calls “Stand by the arrow and turn your lights out”. Thank goodness, it’s only the photographer. Flash, flash, flash…Thanks.. and off we go. Guess what, there’s another 1.5k to the finish. So back up the hill and into the field, turn left, keep going and we come across a guy losing the contents of his stomach. We stop to make sure he is OK, give him something to clean himself up with and make sure he has a drink before realising there are other people with him and it’s OK for us to go on. A couple of minutes later I can hear Liz May saying well done to people as she meets us at the last stretch.. Thanks Liz, for all the support, not just during the race but through all the training and life. OK, last little bit, we start as we mean to go on… we walk. 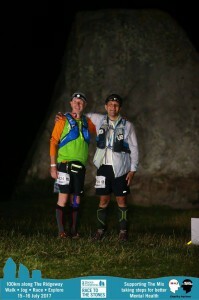 Over the finish line, Franck and I shake hands, maybe hug and go our separate ways in search of food and transport home. Burger and Slaw, cup of coffee in hand, I crash out on a yoga mat for some well earned rest. I finish my food in time to see Steve Morris and Paul “PJ” Jones safely in. Well done guys. 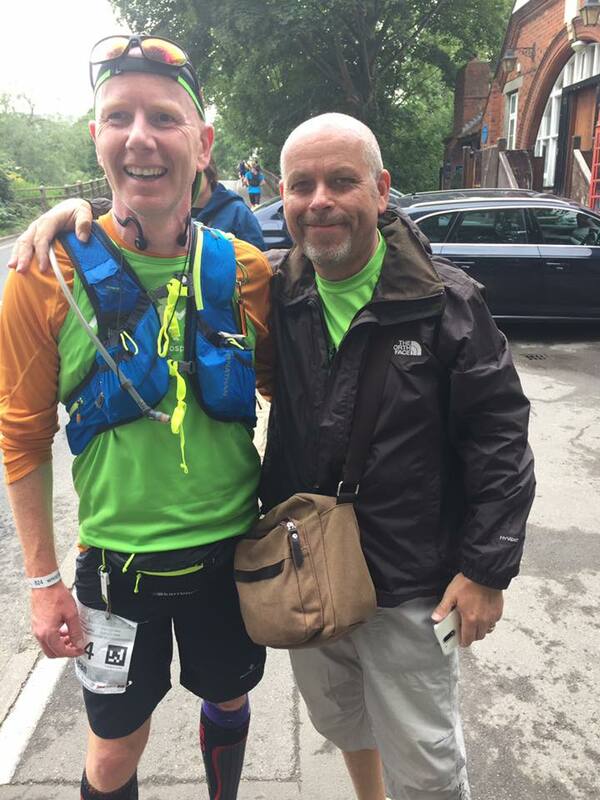 I have to say a huge thank you to the our Redway Runners support crew along the way. Mary Morris, Janet Maidment and Mandy Hockley, to name just a few. No offence to those I missed, the brain couldn’t take it all in. Thank you all. We are pleased to let you know we are starting our next free beginners groups in September 2017 (just after the Summer holidays), we have lots of courses starting. They will be working towards doing the MK Willen Lake free 5K parkrun on Saturday 11 November. If you want a place you need to act quickly as all these courses will be limited to 50 places. This time we are launching eight (yes 8) courses, we are trailling a lunchtime, early afternoon course and we hope to have one with MK Hospital as well (our charity of the year – we are just finalising details for that one). Ideal for those wanting to start running or get back to running. Please do pass on this information to anyone who may be interested. We are in the village of Great Woolstone. This pub was built in the 17th Century. The pub sign shows two keys crossed to form a saltire. This signifies the keys to the Kingdom of Heaven given by Jesus Christ to his chosen successor Peter, who became the first Pope. We are now in the village of Little Woolstone. This pub was built in the early 19th Century to provide refreshment for the navvies building the nearby Grand Junction Canal. The pub sign shows a barge called the Tivertonian. This is one of the few remaining horse drawn canal boats. This is the site of Great Woolstone manor house and fish ponds. The manor house stood to the left of the church. The ponds date from the 14th Century. You will note they are situated close to the river. This was so fresh water was available nearby. Fish was important in the middle ages because the church forbade the eating of meat on Friday and during Lent. The pond on the left was built first to hold fish caught from the river. The other ponds, there were 9 in all, were added later and were used to breed fish which were moved from pond to pond as they grew. This is an Oxbow Lake. It is formed when a wide meander from the main stem of a river is cut off, creating a free-standing body of water. It is so named for its distinctive curved shape resembling the U-shaped piece of wood placed around the neck of oxen holding the yoke in place. St Michael’s Church dates from at least 1189 when it was first mentioned in local records. The present structure dates from the 1350s. Prior to the construction of the marina in 1987, the site was excavated by local archaeologists who discovered the remains of an L-shaped farm house built from timber with a thatched roof and a small detached building thought to be either a kitchen or a brewhouse. The remains of the village can be seen as earthworks in this field. Until the 17th century houses and farms occupied what is now the Ouzel Valley Park and The Green. For reasons which are unclear, the houses were re-built on the edge of the village and from that time the village was known as Woughton on the Green. There are over 800 different variations of box but until recently there were all just one colour……pillar box red! The design of pillar boxes has however evolved over time with engineers constantly trying to improve box design. In 1979 the cylindrical K type box was implemented which was supposed to be easy to paint given the shape and easy to maintain. In reality the design had a serious flaw with the door hinge and the last of this type were installed in 2001. New development areas from that era have a prevalence of K type boxes which is why Milton Keynes has one of the highest densities of K type boxes in the UK. The indentation which runs from the edge of the field, under this bridge and down towards the river was the main road through the medieval village of Woughton known as Meadows Lane. Running Club of the Year? http://www.redwayrunners.com/wp-content/uploads/2017/07/Running-Club-of-the-Year.jpg 398 1024 Martin Lawrence http://www.redwayrunners.com/wp-content/uploads/2013/04/logo.jpg Martin Lawrence2017-07-13 17:19:312017-07-13 17:19:31Running Club of the Year? 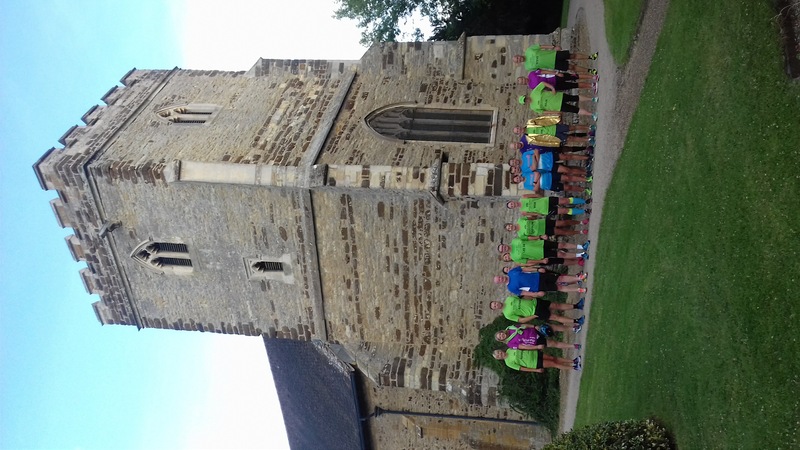 Once again, Saturday’s Willen Lake parkrun took on a distinctly green tinge as the latest group of over 100 beginners tackled the 5k distance to cap off their 10-week course delivered by the Redway Runners. 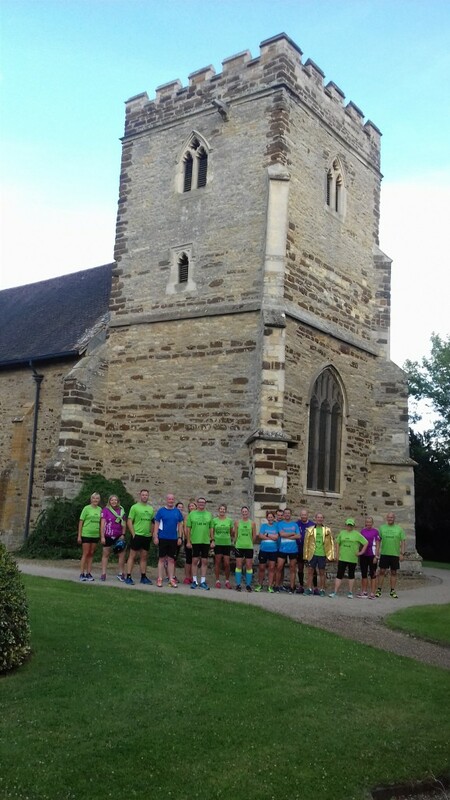 A total of seven beginners groups started in April each led by a member of Redway Runners’ Beginners Run Lead Team supported by a large team of helpers. From not being able to run a whole minute in the first session virtually every beginner ran the whole route on Saturday. Run Lead and Beginners Coordinator Annette Smyth said “It’s fantastic to see how much they develop in just a couple of months and it’s this that makes it so worthwhile for me and all the other Run Leads”. The ‘graduation’ parkrun is a real celebration event for all concerned. Each beginner had a Redway Runner buddy to support them round the route, offer encouragement and help them with the process of getting their time recorded at the end. By sheer coincidence, one of the beginners was paired up with buddy and former midwife Sheila Quinn who cared for her when she had her baby several years ago. The baby is a teenager now and was there to cheer her mum over the line! The standard Redway Runners beginners courses are 10 weeks long but they also provide an extended version for those who feel they need more time to build up their running ability. The courses are free and are intended for all abilities. They are hugely popular and always oversubscribed. The club aims to provide them at different times and on different days of the week to cater for as many people as possible. They’ll be taking a break now for the summer but will be back again in early September. Anyone interested in joining a future course is recommended to check the club’s facebook page or the website at www.redwayrunners.com .